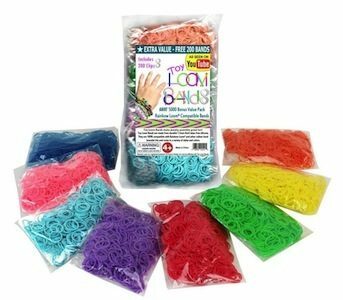 5000-piece Rubber Band Refill Pack With Clips Only $9.99! You are here: Home / Great Deals / Amazon Deals / 5000-piece Rubber Band Refill Pack With Clips Only $9.99! Need more loom bands! Here’s an awesome deal for you. Get this 5000 pc Rubber Band Refill Pack with Clips for only $9.99 on Amazon. You will get 625 bands in each of these colors – Red, Yellow, Green, Blue, Pink, Purple, Turquoise, and Orange. Plus, Super Saver Shipping will be FREE with an order of $35 or more or get FREE 2-day shipping with Amazon Prime.